Introduction: Local resection with adequate margins has been an effective treatment for a gastrointestinal mesenchymal tumor (GIMT). However, the treatment strategy for a GIMT that is located close to the esophago-gastric junction (EGJ) remains controversial. 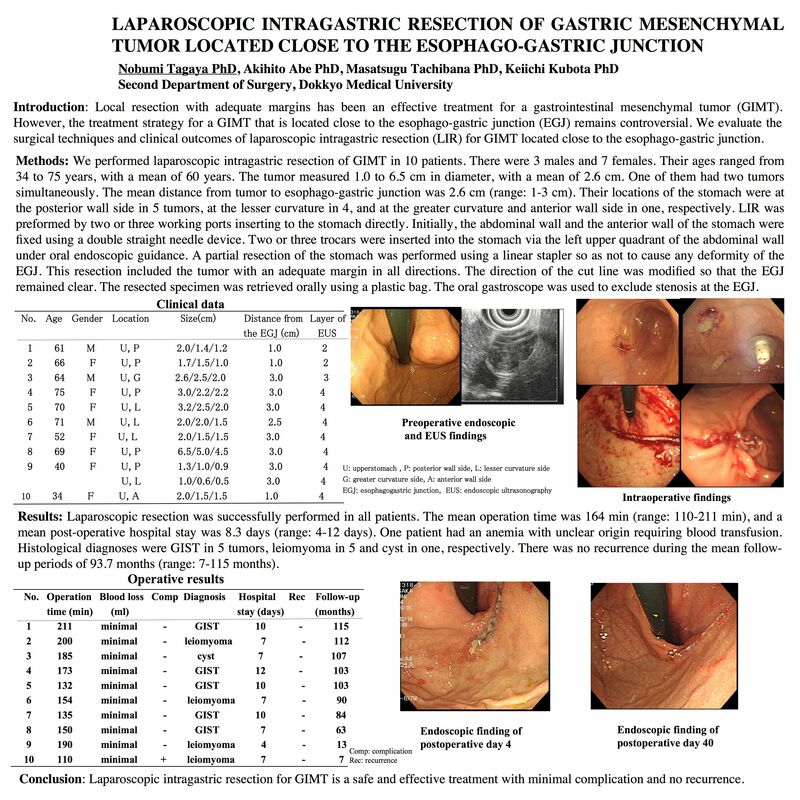 We evaluate the surgical techniques and clinical outcomes of laparoscopic intragastric resection (LIR) for GIMT located close to the esophago-gastric junction. Methods: We performed laparoscopic intragastric resection of GIMT in 10 patients. There were 3 males and 7 females. Their ages ranged from 34 to 75 years, with a mean of 60 years. The tumor measured 1.0 to 6.5 cm in diameter, with a mean of 2.6 cm. One of them had two tumors simultaneously. The mean distance from tumor to esophago-gastric junction was 2.6 cm (range: 1-3 cm). Their locations of the stomach were at the posterior wall side in 5 tumors, at the lesser curvature in 4, and at the greater curvature and anterior wall side in one, respectively. LIR was preformed by two or three working ports inserting to the stomach directly. Initially, the abdominal wall and the anterior wall of the stomach were fixed using a double straight needle device. Two or three trocars were inserted into the stomach via the left upper quadrant of the abdominal wall under oral endoscopic guidance. A partial resection of the stomach was performed using a linear stapler so as not to cause any deformity of the EGJ. This resection included the tumor with an adequate margin in all directions. The direction of the cut line was modified so that the EGJ remained clear. The resected specimen was retrieved orally using a plastic bag. The oral gastroscope was used to exclude stenosis at the EGJ. Results: Laparoscopic resection was successfully performed in all patients. The mean operation time was 164 min (range: 110-211 min), and a mean post-operative hospital stay was 8.3 days (range: 4-12 days). One patient had an anemia with unclear origin requiring blood transfusion. Histological diagnoses were GIST in 5 tumors, leiomyoma in 5 and cyst in one, respectively. There was no recurrence during the mean follow-up periods of 93.7 months (range: 7-115 months). Conclusion: Laparoscopic intragastric resection for GIMT is a safe and effective treatment with minimal complication and no recurrence.